Wouldn't it be nice if calories in food weren't that complicated? Yes, you have to count calories. Otherwise going on a low calorie diet just isn't going to work out. Do you know your calories in food like you should to making counting calories in your low calorie diet actually work? - Counting food calories is harder than it looks. With so many different types of food out there, knowing exactly where to get started is no short of a maze. Luckily enough, you are in the right place because we are going to be talking about the calories in food. Making a quick comparison of various meat calories, it's not hard to conclude that calories in beef, pork, and chicken decrease in succeeding order with chicken breast being the lowest in calories. Although with skin it comes out to 191 calories per 100g serving size quickly making it high calorie. That is why removing the skin when cooking can help you reduce calories down 75 calories easily. When you are on a diet eating meats low in calories removing the fatty parts before cooking makes a quick and easy calories reduction. When on a diet grains although a staple food is thought to be one food you want to stay away with. That would be the case only considering breads containing gross amounts of sugar and butter, which are relative high calorie grain foods. Nutritional balance is the key to succeeding in your diet for weight loss. No diet would be right without grains giving you the energy you need to stay active. Eating cooked rice and okayu are highly recommended. Note that instant ramen and cup foods may be considered grains but they are also considered high calorie. For instance, 1 serving of cup ramen sets you back at a bare minimum of 300 calories a pop. That is something you don't want to worry about while trying to lose weight. It just goes to say that instant foods are convenient when you are eating but inconvenient when on a diet. How are you going to burn those calories? Having to go to the gym or on a run around the neighborhood just because you ate a cup of instant ramen noodles is not recommended. Though don't let that keep you from treating yourself everyone in a while. After all, this isn't Sparta! Food calories in fish and seafood are no different than any other food source. There are high calorie and low calories foods. For example, take the case of fatty tuna as you will see served at your favorite sushi restaurant telling the waiter, "Please give me fatty." Just when you thought it was so delicious you want to do it again sometime, the waiter brings over the bill. That's 340 calories! Yes, fatty tuna is high in calories. However, eating lean tuna or akami as it is called in native Japanese is not that bad. With only 125 calories per 100g serving size, you can go home happy not having to pick your pocket trying to figure out how to burn calories before bedtime. All low calorie foods from the sea include freshwater clam, hamaguri, and oyster that are all under 100 calories per 100g. Most vegetables come less than 100 calories, with the exception of edamame soy beans. Vegetables with less than 100 calories include bell peppers, and eggplant. Eating vegetable brings value vitamins and minerals into your diet for an improved lifelong health perspective as well as cosmetic benefits in your skin keeping you looking young longer. There is no need to be nervous about the calories in vegetables. Make sure to get as much vegetables in your diet as possible. Fruit is a rich source of vitamins and minerals that are important even when you are not on a diet for your health. As long as you don't eat too much calories there is no reason you should have to worry. 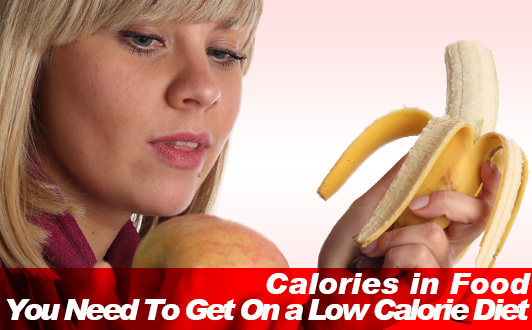 There are high and low calories fruits. High calories include dried fruit. In particular, dried mango has 368 calories per 100g. Surprising enough banana chips can be as much as 521 calories. Be careful when eating dried fruit on a diet. When talking about dairy what comes to mind first is that there is a divide between low fat milk and whole milk that makes you think. For example, whole milk is 67 calories per 100g whereas low fat milk is at most 45 calories. That's a difference of 20 calories per 100 grams. Ice cream works in the same manner. Normal ice cream can be as much as 180 calories per 100g serving size. However, low fat ice cream is 108 calories. If you are not counting calories in food, you can now see how easy it is to quickly lose track of your daily caloric intake with respect to calories in food. Having an empty stomach dealing with hunger pains is said to be the leading cause of stress for people on a diet. In order to keep your diet up, eliminating stress at the source is going to keep your from binge eating. Eating a balance of foods low in calories while making compromises for nutrition eating high calorie foods will help you make out great in your diet.